LINDSAY, ON, June 1, 2016 /CNW/ - Today marked the final day of a weeklong competition that saw the top 18 Ontario Envirothon schools from across the province compete for the title of Ontario Envirothon Champion at Fleming College, Lindsay, Ontario. This year's Ontario Envirothon Champion is University of Toronto Schools from Toronto, who triumphed over 18 other teams from across the province. St. Elizabeth Catholic High School from Thornhill and Cardinal Newman High School from Stoney Creek placed second and third respectively. "Envirothon is a unique educational program that takes students beyond the classroom to learn about our natural ecosystems first-hand and builds their skills as green leaders," said Rob Keen, CEO of Forests Ontario. "The Championship allows students from across the province to come together to share their ideas and work collaboratively to present solutions for complex problems facing our environment and learn how they can make changes in their own lives to help lessen environmental impacts." The Ontario Envirothon is a province-wide program that celebrates student's passion for the outdoors and engages them to be part of a team. In the months leading up to the provincial championship, students participated in outdoor events in 18 different regions across the province, all mentored by professionals working in natural resources. 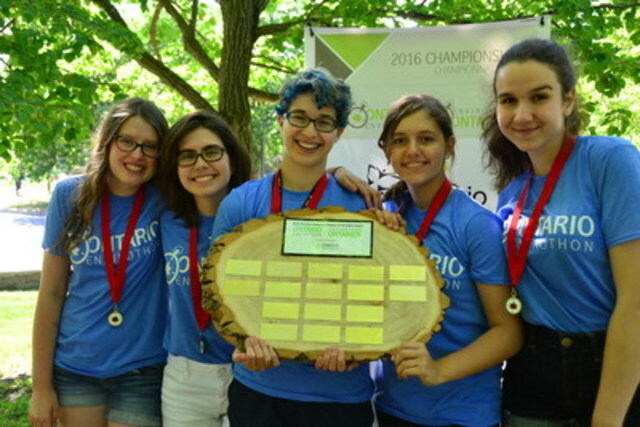 After winning their regional events, the top teams earned a chance to compete at the Ontario Envirothon Championship that was held from May 29-June 1. In addition to winning a cash prize from Maple Leaves Forever, as the Ontario Envirothon Champion the team from University of Toronto Schools will represent the province at the North America Envirothon (NAE) which will take place at Trent University in Peterborough from July 24-29, 2016. The 2016 NAE is the first time the event will be hosted in Ontario and Forests Ontario is excited to have this opportunity to showcase Peterborough as a center for environmental education, research, and innovation. The NAE is a program of the National Conservation Foundation, and is the culmination of more than 50 state and provincial Envirothon programs in which students learn about the workings of natural ecosystems and apply their skills and knowledge in science, resource management, and conservation to address environmental challenges. The top performing students from each state and regional program progress to the NAE to test their skills and knowledge against the best from across North America. More than 500 students, teachers and volunteers will travel to Peterborough to participate in the 2016 NAE. Forests Ontario is the voice for our forests. Working to promote a future of healthy forests sustaining healthy people, Forests Ontario is committed to the re-greening of Ontario through tree planting efforts on rural lands and in urban areas, as well as the renewal and stewardship of Ontario's forests through restoration, education and awareness. Visit www.forestsontario.ca or follow us @Forests_Ontario.